Description: When the body of a young woman is discovered in a derelict cottage in the middle of Los Angeles National Forest, Homicide Detective Robert Hunter finds himself entering a horrific and recurring nightmare. Naked, strung from two parallel wooden posts, the victim was sadistically tortured before meeting an excruciatingly painful death. All the skin has been ripped from her face – while she was still alive. On the nape of her neck has been carved a strange double-cross: the signature of a psychopath known as the Crucifix Killer. But that’s impossible. 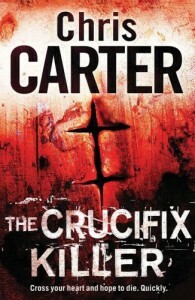 Because two years ago, the Crucifix Killer was caught and executed. Could this therefore be a copycat killer? Or could the unthinkable be true? Is the real killer still out there, ready to embark once again on a vicious and violent killing spree, selecting his victims seemingly at random, taunting Robert Hunter with his inability to catch him? Hunter and his rookie partner are about to enter a nightmare beyond imagining. Review: As a first novel Chris Carter has provided great competition to those who are already well established in this genre e.g. James Paterson. The author has used his skills gained when studying psychology and criminal behaviour throughout this novel. There are two main characters Detective Robert Hunter an experienced but cynical detective who has little or no faith in humanity. His experiences as a detective have contributed greatly to his cynicism and his nightmares. His style of detection is mainly instinctive and focused.His partner Garcia is a rookie with all the enthusiasm that position holds, his detective style is extremely methodical.Their different styles often clash but they hold respect for each other, makes interesting reading. There are two plots running through this novel that both the detectives and the readers find it difficult to unravel and separate. The main thread is in the pursuit and hopefully capture of a serial killer. When the body of a young woman is discovered in a derelict cottage in the middle of L.A. Robert Hunter is reliving both the horror and the nightmare. A sign is left on her body that the detective recognises, but that’s impossible. because two years ago the killer was caught and executed. Could this be a copycat killer or was the wrong man executed. It has an exciting climax that as a reader I did not expect. Thank you Simon and Schuster for sending me this book to review.